First off, a huge thanks to the OG community, I've learnt so much already just from reading and asking a couple of questions. This place is awesome! 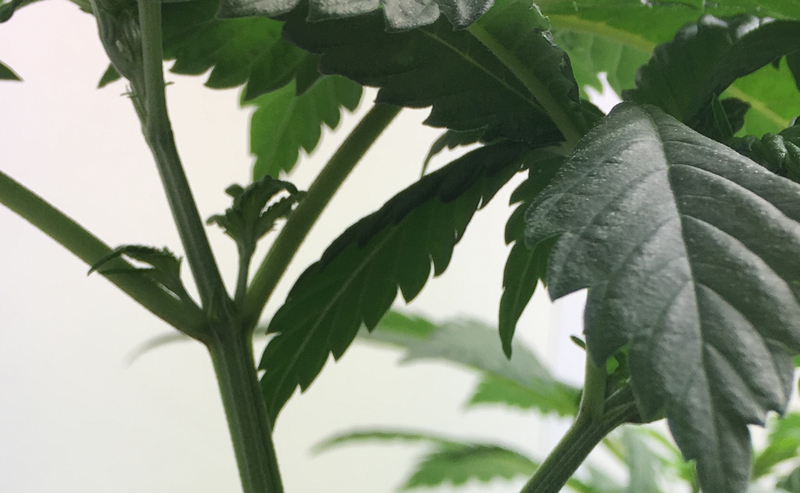 The strain is Amsterdam Genetics Lemon Ice, and they're being grown organically. Nutrients - BioBizz - RootJuice, BioGrow, BioBloom, then probably Top Max and/or Bio Heaven etc, but we'll cross that bridge when we get to it. From 10 seeds, 8 made it through seedling growth. Here are the survivors 14 days after first sprouting. They've had a second feeding with Root Juice, will go onto BioGrow soon. Doing everything in a 1.2m x .8m cabinet, but that'll become the bloom box for the next run, got a wardrobe lined up for conversion to a veg box with a propagation box at the bottom. Looking forwards to learning more as I go with this. Looking good and welcome! Do you have a fan blowing on those seedlings to help strengthen them up? Looking good! Avoid the temptation to overwater, trust me it's hard lol. That strain should be nice, good combo! Thanks, yeh I'm being cautious. Some are thirstier than others, the weight of the pots indicates it, and generally corresponds to the size of the plant above ground. Lemon Haze is an all time favourite, so I'm hoping to come out with something just as tasty! But now she's got going with the next node, it looks like a double! That's pretty exciting. Hopefully it's nothing to worry about, and she's gonna be a beauty. Has anybody come across this? They're all responding well to the Biogrow. They've had three feedings since my last post, and straight ph6.5 water today. Just feeding/watering until we get a bit of run-off, and judging by weight over anything else. 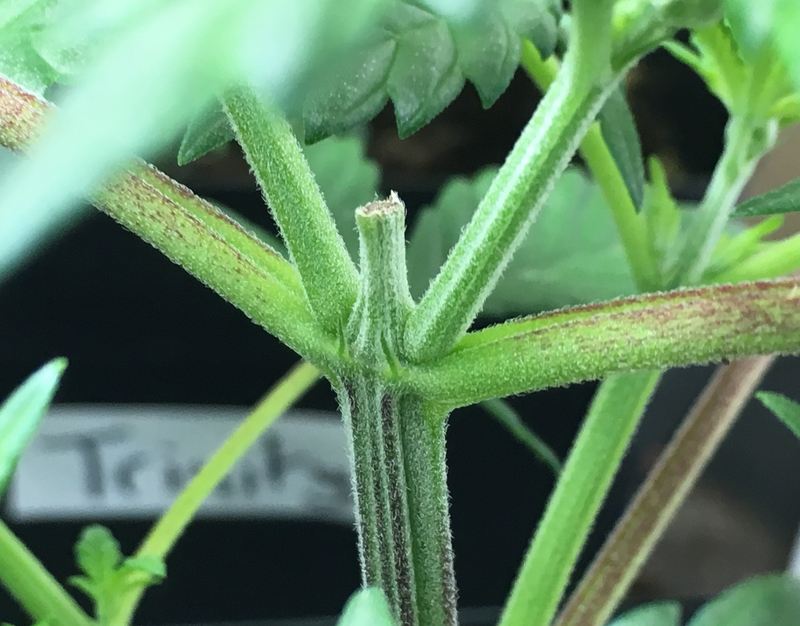 The double node girl's looking good, it's almost like she self-topped! On the subject of topping, I've seen people giving plants slightly less developed than this the chop, and I like the idea of spreading the canopy out with more colas (since I think I have the space width wise, and will likely only take 6 of them through to flower), so I'm thinking of going for it tonight before lights out to give them the night to recover. I'm not sure what to do about the self-topper, I have a feeling she's gonna be real tall, so maybe a double-top is required...? I'm also keen to start training them out for width over height, but I'll leave that until they're settled in their mid-size pots. Had a look at one of them out of her pot last night, and the roots have still got a bit of space, maybe a few days to a week off re-potting. The other three that I did properly top have responded really well, with new growths shooting off as they're supposed to! We also transplanted them all up into larger pots, as they were starting to require watering every day, and the roots were filling out their little pots really well. Now for the sad news... Two of them have to go! The plan was always to take six through to flowering, and it's already pretty obvious that eight's too many in this box! Once there's a bit more space in there I can start some LST, and will top all the others. 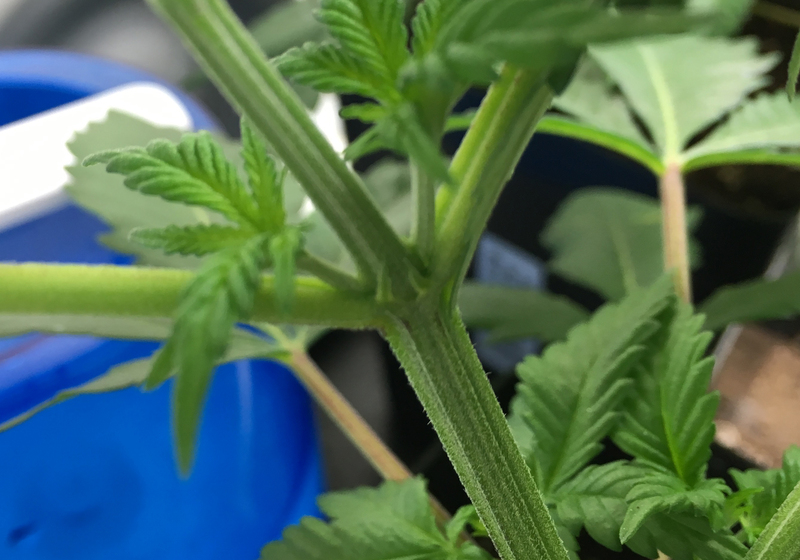 Should I be worried about topping off more than one growth on a plant in one go? Roberta (the self-topper) could really do with it on both her main stems now, but I don't want to hit her too hard in one go. That's no reflection on this community at all, just my paranoia/anxiety about communicating about this stuff in the real world. It's probably just beginners luck that they've made it this far without disaster. I'm really fond of them though, they are beauties. They're feminised, yep. 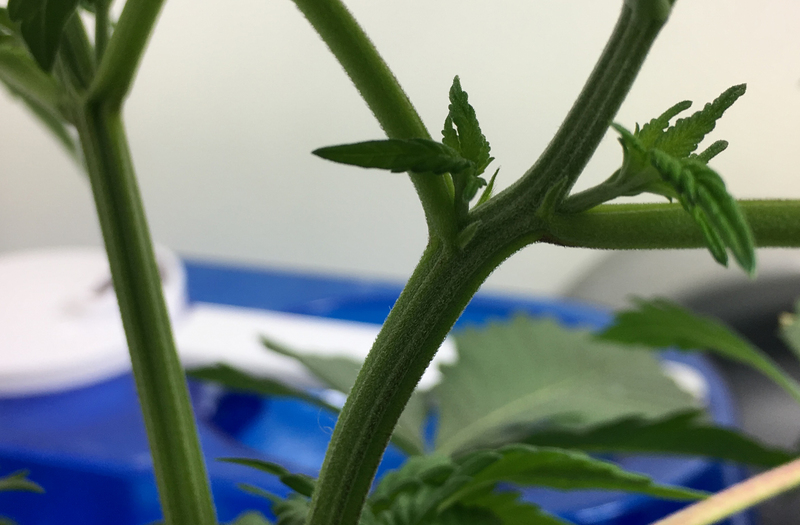 I think I can already see pistils on them all. Here's the best photo I have of Roberta from earlier today. I'll get in closer when I'm next with them tomorrow. Hopefully you can see what I'm talking about. Maybe I'm jumping the gun and mis-sexing them, I'm just going off pictures online and in books. I'd hate for her to be a him though, no space for dudes in here! This is about the best I could do with my phone. What do you think, too soon to tell? Strange how she's grown at that point there, but it seems isolated to that one node. Getting my wires crossed. That's good news though, it felt way too early. Looks like a real 420 treat for me today!